JJ Sullivan is a family run business with over 40 years experience in construction and timber framed buildings. We design and build bespoke, high quality oak framed cart lodges and custom designed to client specifications. 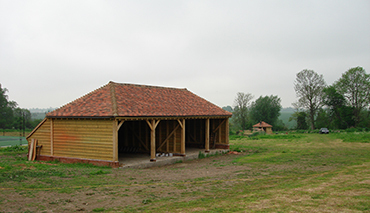 We pride ourselves in offering a genuine, traditionally constructed oak timber frame, using mortice, tenon and dovetail joints to name a few. We offer exceptional customer service and provide tailored quotations specifically to client requirements. 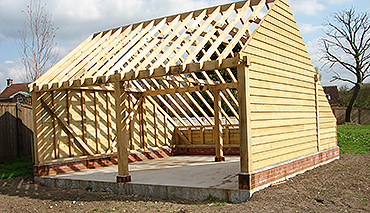 We can build to include loft space, living space, games room or guest rooms; or purely as a car port. 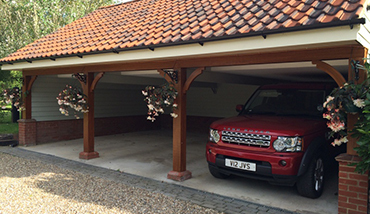 Generally, oak cart lodges start as a two bay in size, although this can be altered to suit your design. Below are some examples of our two, three and four bay oak cart lodges. Please feel free to contact us if you have any questions about our services or would like a consultation for your own oak cart lodge project.